The International Council on Security and Development (formerly the Senlis Council) has issued an important update to their outstanding coverage and analysis of the security situation in Afghanistan, entitled Struggle for Kabul: The Taliban Advance. The full report is required reading for military and anyone interested in Afghanistan, but selected citations from the situation update are provided below. 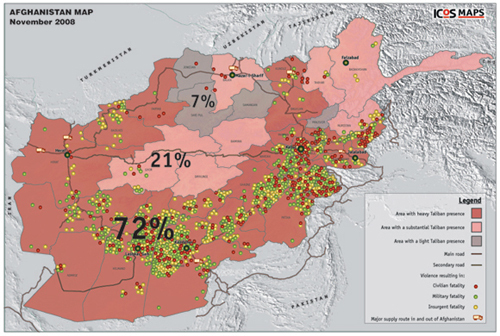 … as seven years of missed opportunity have rolled by, the Taliban has rooted itself across increasing swathes of Afghan territory. According to research undertaken by ICOS throughout 2008, the Taliban now has a permanent presence in 72% of the country. Moreover, it is now seen as the de facto governing power in a number of southern towns and villages. This figure is up from 54% in November 2007, as outlined in the ICOS report Stumbling into Chaos: Afghanistan on the Brink. The increase in their geographic spread illustrates that the Taliban’s political, military and economic strategies are now more successful than the West’s in Afghanistan. Confident in their expansion beyond the rural south, the Taliban are at the gates of the capital and infiltrating the city at will. Of the four doors leading out of Kabul, three are now compromised by Taliban activity. The roads to the west, towards the Afghan National Ring Road through Wardak to Kandahar become unsafe for Afghan or international travel by the time travellers reach the entrance to Wardak province, which is about thirty minutes from the city limits. The road south to Logar is no longer safe for Afghan or international travel. The road east to Jalalabad is not safe for Afghan or international travel once travellers reach the Sarobi Junction which is about an hour outside of the city. Of the two roads leaving the city to the north only one – the road towards the Panjshir valley, Salang tunnel and Mazar – is considered safe for Afghan and international travel. The second road towards the north which leads to the Bagram Air Base is frequently used by foreign and military convoys and subject to insurgent attacks. By blocking the doors to the city in this way, the Taliban insurgents are closing a noose around the city and establishing bases close to the city from which to launch attacks inside it. Using these bases, the Taliban and insurgent attacks in Kabul have increased dramatically – including kidnapping of Afghans and foreigners, various bomb attacks and assassinations. This dynamic has created a fertile environment for criminal activity, and the links between the Taliban and criminals are increasing and the lines between the various violent actors becoming blurred. All of these Taliban successes are forcing the Afghan government and the West to the negotiating table. 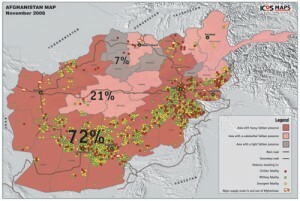 There are themes throughout the report consistent with those at The Captain’s Journal, such as the conduct of counter-terrorism rather than counterinsurgency (page 19 of the report, see The Captain’s Journal, Concerning Turning Over Afghanistan to Special Operations Forces and The Cult of Special Forces). Furthermore, the concern over Kabul happens to coincide exactly with Twenty Minutes from Kabul, which we published just one day prior to ICOS study. The security situation in and around Kabul is degrading, as the visual below shows. Finally, as if to put the exclamation point on the concern over Kabul, it has been announced that the upcoming additional troop deployments to Afghanistan will go to the Kabul area of operations. Most of the additional American troops arriving in Afghanistan early next year will be deployed near the capital, Kabul, American military commanders here say, in a measure of how precarious the war effort has become. It will be the first time that American or coalition forces have been deployed in large numbers on the southern flank of the city, a decision that reflects the rising concerns among military officers, diplomats and government officials about the increasing vulnerability of the capital and the surrounding area. The new Army brigade, the Third Brigade of the 10th Mountain Division from Fort Drum, N.Y., is scheduled to arrive in Afghanistan in January and will consist of 3,500 to 4,000 soldiers. The “vast majority” of them will be sent to Logar and Wardak Provinces, adjacent to Kabul, said Lt. Col. Rumi Nielson-Green, a spokeswoman for the American units in eastern Afghanistan. A battalion of at least several hundred soldiers from that brigade will go to the border region in the east, where American forces have been locked in some of the fiercest fighting this year. It doesn’t bode well for the campaign when the seat of government – such as it is – is in danger of collapse, and it is yet another sign of the need for additional troops in Afghanistan, as well as transition from the high value target counter-terrorism campaign to one of full-orbed counterinsurgency.